This whitepaper will provide an overview on how powerful computing and software technologies enable real time fraud detection to cut losses and reduce risks. 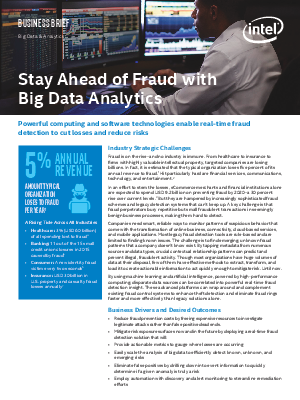 By using machine learning and artificial intelligence, and powered by high performance computing, disparate data sources can be correlated into powerful real-time fraud, detection insight. Companies need smart, reliable ways to monitor patterns of suspicious behaviour that come with the transformation of online business, connectivity, cloud-based services, and mobile applications. Most legacy fraud detection tools are rule-based and are limited to finding known issues. The challenge is to find emerging, unknown fraud patterns that a company doesn’t know exist. By tapping metadata from numerous sources and data types, crucial contextual relationship patterns can predict and prevent illegal, fraudulent activity. Though most organizations have huge volumes of data at their disposal, few of them have effective methods to extract, transform, and load it to create actionable information to act quickly enough to mitigate risk. Until now.